← Validate bad times, c’mon! Do you have a constant second hand shopping list floating around your mind at all times? It is almost certainly a waste of brain space (space that for me I suspect could have been used up in the area of knowing how to pronounce certain words) but it does nurture patience and acceptance as you wander around charity shops and car boot fairs, not finding the things you want but knowing you will one day. And I have quite few reams of lace. I like to stack it in piles and have crafted a few lovely things out of it- my favourite being this flapper style head band for a friend’s little lass. A little while ago I found a few tutorials for lace lampshades on Pinterest and, although we are not in need of lampshades as I am whipping these up all the time out of totally obvious things like zips, I wondered if the same principle could be use to craft up some bowls. Turns out it can. HOORAY! Step 1- Blow up a balloon to about the size you want the bowl to be. 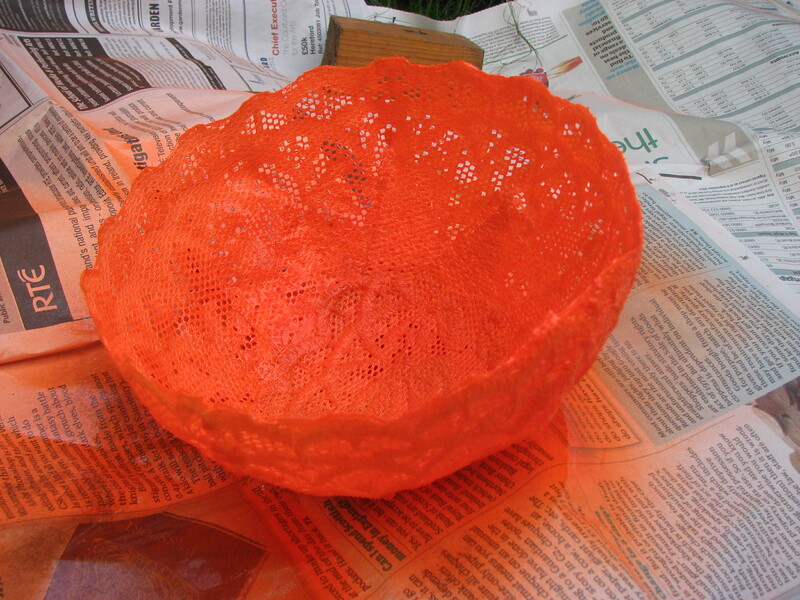 Step 2 – Take a strip of lace – the length needs to go around the balloon and will be the circumference of your bowl. The width will be the side of the bowl. Mine was around 27 inches long and I chose 5 inches in width. Step 4 – Dunk this into mod podge. Step 5- Wrap this around the bottom half of your balloon, overlapping each one inch segment by just a few millimetres. Doing this allows the lace to curve around, without having to have pleats. 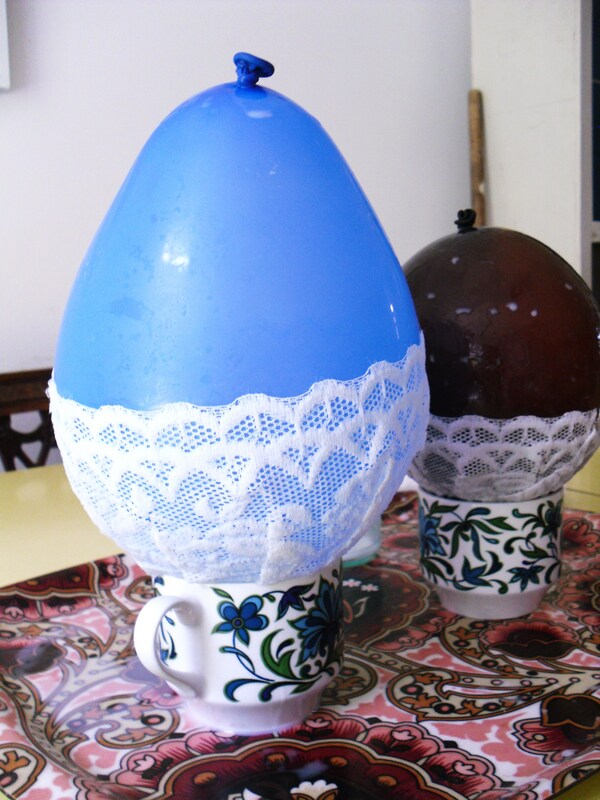 The bottom rim should be curving under the balloon, leaving an empty bit at base of balloon. Step 6- Make sure the seam and each overlap is well pushed together. Be warned, it does all get a bit slippy and slithery and your balloon my try and escape your grasp a bit! Step 9- Pop balloon! You should have a fairly sturdy bowl with no bottom! Step 10- Tweak it a little, bending it gently in to the right shape, if needed. Step 11- Cut out a piece of lace to be the bottom. It needs to be whatever shape the balloon happens to have made it! Mine was a kind of small oval. Step 13- Give a light coat of varnish around the outside. My varnish dries in an hour, if in warm, breezy place. Step 14- Give a light coat of varnish throughout the inside. Especially seal off the edges of the bottom piece. Step 14- If you like the original colour of the lace then VOILA! You are done. Step 15- If, like me, you used an ancient tin of varnish because you are too stingy to throw it away and it was really yellow, you will need to find a spray can colour you are happy with. I went for neon orange and I LOVE IT! It isn’t perfect, if you were to inspect you would see it was slightly wonky and the seams would be quite obvious but I think the “lacey bowl” effect is nailed. The overall paint coverage hides a whole load of the little discrepancies. I am pretty sure, taking out drying time, that the whole thing is done in a matter of moments – possibly one of the quickest crafting up of a bowl ever? Of course, it isn’t water tight, so you cannae eat your cornflakes out of it, but as a vestibule for bits and bobs (of which our household needs many) it is purdy purfick. 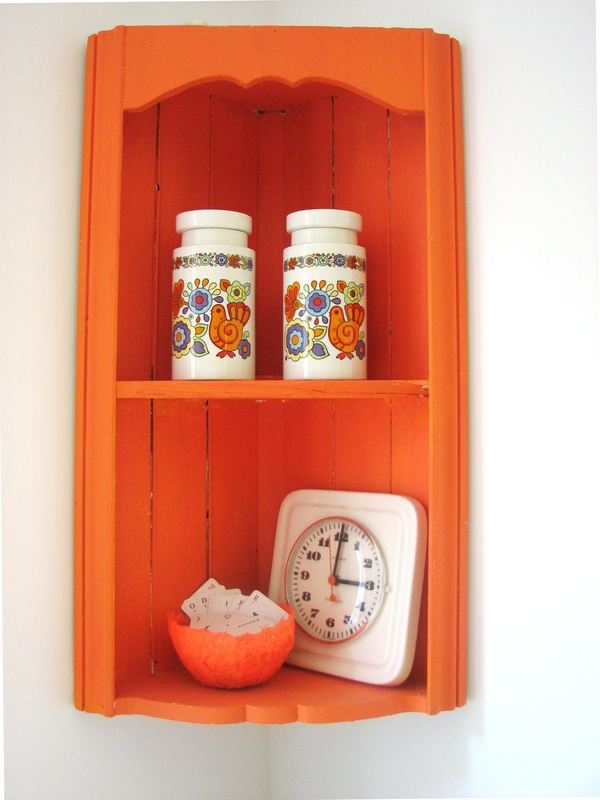 It is sitting in my little kitchen pop of orange, underneath some heart palpitatingly beautiful pottery I found at a car booty last week. The pottery, it is called Lord Nelson Gaytime. Honestly. You couldn’t make it up. Linking up with the magical Liz and the Magpies- celebrators of all things second hand. 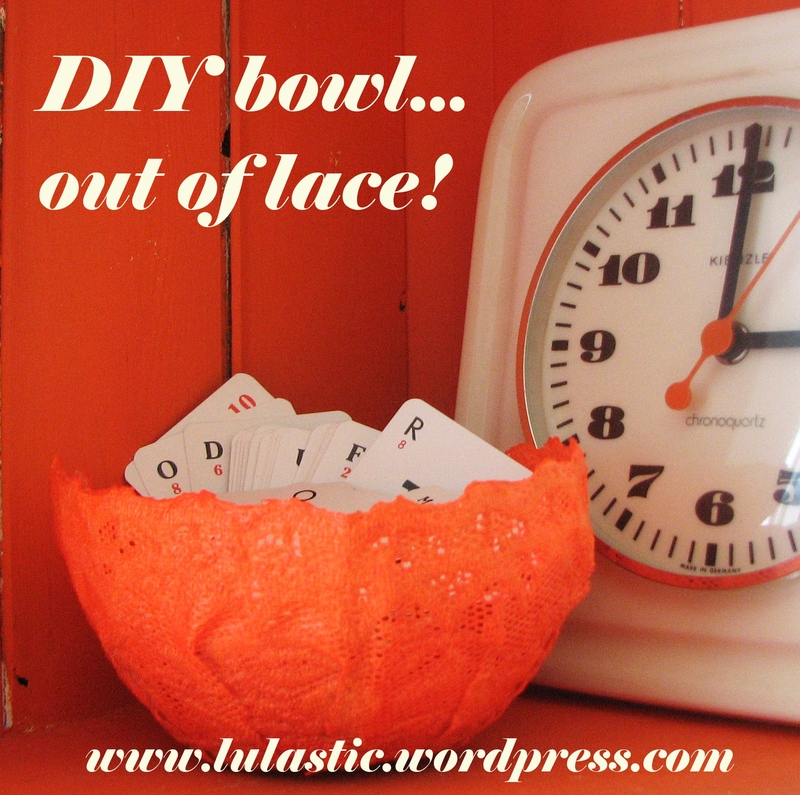 Posted in Craftiness, Thrifty and tagged bowl, craft, lace, upcycle. Bookmark the permalink. I LOVE those vases and their name. Also…. awry. He he he. Jokes, just jokes. I am equally as proud of my Lord Nelson Gaytime find. I have wondered about other fabric… I am sure it can be done, but I get stuck on the inside/outside bit. One side would look awesome, and one would look a bit rubbish? Lace is obviously lush on both sides. A bit like my doily bowls, but lace may be easier to come by?? I love your charity shop wish list – I have a similar one myself. Purdy! I too have a wish list for tat, although if you’re looking for pretty much the same things that I am then others must be too, no wonder my wants are few and far between! Is there enough tat to go around I wonder?! lovely pottery with a great name! Great idea and I love the colour. Thank you! The neon makes it a bit less old lady! I always have those two things tucked in a draw along with chalk, buttons, pens with no lids etc etc! This is great and thanks for the homemade Modpodge recipe. I have a pile of doilies that I have been meaning to turn into bowls too. When will I ever get around to all these projects? PS Love your charity shop wishlist – mine is quite similar! Ah defintely have to go and look at Liz’s doily craft, I don’t have any but only because I wonder what i will do with them once home. Now I know! No really, really, apart form the slipiness it is SUPER easy and quick! I reckon second and third ones would be even easier too.